I was listening to “Science Friday” on NPR last week and heard about the work of Ted Kaptchuk, Director of Harvard University’s Program in Placebo Studies and the Therapeutic Encounter. I was particularly interested in one of his studies that investigated placebo effects on asthma. This study tested physical effects of real medication vs. placebos as well as patients’ perceptions of the effects. Over the course of 12 sessions, subjects were given the following three different treatments and a non-treatment session three times each: 1) an albuterol inhaler, 2) a placebo inhaler, 3) a fake acupuncture treatment, and 4) several minutes in the waiting room with no subsequent treatment. In each case physical effects were subsequently tested by measuring subjects’ lung capacity and subjective effects were tested by asking subjects to rate their perception of improvement on a 1 to 10 point scale. Based on actual lung function, the albuterol inhaler—the only real medical treatment—produced a 20% improvement while the two placebo treatments and waiting without treatment each produced a 7% improvement. Apparently the mere act of sitting for a while without activity produced some improvement. What’s interesting is that, even though neither placebo produced an effect greater than no treatment at all, indicating the absence of an objective placebo effect, subjective perceptions were quite different. Subjects reported the following perceived levels of improvement: 50% for the albuterol inhaler, 45% for the placebo inhaler, 46% for the fake acupuncture treatment, and 21% for merely waiting without treatment. 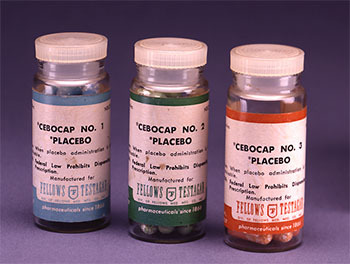 Both placebo treatments provided subjective perceptions of improvement that were almost as great as the medical treatment. He tells the Health Blog that when it comes to things like asthma or cholesterol or diabetes, while patient reports are important, it’s key to keep tabs on objective measures, too. I may feel great, but if my cholesterol level isn’t budging, the statin isn’t working and my risk for another heart attack isn’t going down. But in conditions such as depression, pain and insomnia, the subjective response is the main thing being treated. If I’m depressed, take a pill and no longer feel depressed, by definition the medicine is working. There’s no blood or imaging test used to confirm whether my condition is being fixed. I share Kaptchuk’s opinion. In a case such as insomnia, if a placebo allows someone to sleep, it does the job, and that’s enough. If a patient’s health is at risk, however, making her think she’s getting better when she isn’t is potentially harmful. As I was listening to this story on NPR, I began to think of similar issues involving data visualization. If people enjoy your infographic, isn’t that enough? Or in the realm of information dashboards, if the CEO has fun looking at the flashy gauges, isn’t that enough? No, it isn’t. Both are meant to inform. To understand the story of an infographic or an organization’s performance on a dashboard requires real information. Enjoying a pretty picture and feeling like you’ve been informed is not the same as the actual understanding that’s needed to make better decisions. I like to feel good as much as the next guy. Data visualizations often give me great pleasure. I do not think, however, that enjoyment is the goal. It is not essential. In fact, enjoyment that distracts from the information rather than drawing people into it in meaningful and useful ways impedes the goal. When it comes to the real health of people’s minds and decisions, placebos are definitely not enough. Not sure I agree about insomnia. If you think you’ve slept, but you’re not really well-rested, that’s not a reasonable outcome. Especially for someone like an airline pilot. Perhaps people can tell if they are well-rested or not, if they know what that feels like, but people are terrible at judging their own alertness. On the topic of data visualization, enjoyment has an important role– particularly for people who are not committed to careful data analysis. If the CEO’s eyes glaze over at the sight of a complex but accurate and clearly designed visualization, it’s worse than not presenting the data, since the CEO won’t actually read the data, but everyone will assume (s)he did. One of the values of an infographic is novelty. Because it looks novel, you aren’t likely to confuse it with something else you’ve seen. A risk with utilitarian visualizations is that you can end up with a dozen pages with identical looking bar graphs, each containing different data. While expert users will know to look at the page heading, a novice may briefly glance at one page and assume it’s a different one. Notice that I said that a placebo is enough if it “allows someone to sleep,” not gives her the illusion of sleep. Regarding data visualization, enjoyment can certainly be useful if it promotes understanding. The point is that enjoyment alone is not the goal, and enjoyment that doesn’t promote understanding is working against the goal. If the CEO’s eyes glaze over for whatever reason, the display is useless. The trick is to get the CEO to not only look, but to see and understand something worthwhile. Looking at something meaningless, no matter how interesting or attractive, will not promote the organization’s objectives. Novelty can certainly be useful in an infographic, if that novelty actually supports understanding. Novelty for novelty’s sake is useless and often harmful. In a dozen page report of sales – one for each or 12 products – should each page display the data in a different way? The best way to catch the reader’s interest on each page would be to highlight one or more items of interest. When gratuitous visual effects and novelty act as placebos, capturing the viewers attention with content that doesn’t actually help them understand the information, it does harm. On the other hand, any aspect of design that draws the viewer into the information in meaningful ways that lead to understanding are “utiliarian” (to use your term). Good designers know that simply capturing someone’s attention is not enough. I certainly agree with the visualization placebo – too often businesses feel the gratification of merely converting their data reports into graphical [reporting] dashboards, rather than tapping into their real potential as performance management systems. Who said the visualization needed to be complex? You can give the CEO a simple presentation that allows him to visualize the data clearly, and I assure you his eyes will _not_ glaze over. But if he’s only being entertained by a novel presentation that poorly presents (or worse yet misrepresents) the data, he is more likely to make wrong decisions, regardless of how engaged he is. I agree with Andrew – a simple, clear and accurate presentation of the data is what is required to stop anybody’s eyes glazing over. Firstly thanks for your great posting. I agree with the point of the article, because Visualization Vendors are not interested if your company are going well, but only to sell and make money. That’s nothing wrong with that. But the point is: Today the visualization tools don’t prove (yet) the ROI for Tech/Analyst level. I think that today more and more companies are interested in make the things ‘beautiful’, but they don’t see, for example their DW/BI environments; so stay in a simple example. Thanks all for your attention! Is enjoyment the essential attribute of a placebo? I don’t think so. What a placebo creates is attention. That in itself is good. The healers among us can debate whether mere attention hastens healing. But the generalists among us know that attention does hasten understanding. When an audience pays attention, they’re more likely to get the message — whether they’re looking at visualized data or spreadsheet data. They’re more likely to pay attention to a visualization because we’re just wired that way — whether or not the visualization actually delivers any pleasure. In the first stage, the viz isn’t the payload, it’s just the booster rocket. But isn’t getting there half the fun? What I understand from this article is that data visualizations are somehow overrated because the user should care about the information he needs and not about the way it is presented. In the end this is true, but I’m sure that “eye candy” will increase user adoption when you release a new dashboard in your BI environment. I think you misunderstood the article. Stephen is suggesting that flawed visuals chosen solely for aesthetic appeal (so-called “eye candy”) have a placebo effect: they often fail to communicate to the user, but the user feels placated by them because they look pretty. In other words, the way in which data are presented is of utmost importance. Also, I disagree that “eye candy” increases user adoption significantly, as so many seem to claim. In my experience, simple dashboards that present the data clearly tend to elicit overwhelming interest from the users and, consequently, company-wide adoption. Good discussion. There’s definitely a dilemma: too ‘un-enjoyable’ and you’ll get few returning customers; too ‘pretty’ and your audience may miss the message focusing too much on the medium. The good news is that most business folks are hungry for insights about their business and data. Clear and simple presentation of their data in a way that removes distraction is often novel enough.